(PhysOrg.com) -- Some dramatic galaxies eject gigantic, collimated jets of ionized gas millions of light-years long, powered by the massive black holes at their centers. The ionized jets are detected at radio wavelengths, and sometimes in the optical, but most of these active galactic nuclei also produce X-rays in the vicinities of the nuclei. The X-ray emission helps astronomers to determine the physical processes responsible for the jets, as well as the nature of the galactic nuclei, their environment, and the properties of the black holes themselves. In most galaxies with radio jets, however, the X-ray studies are difficult because the emission is faint and the galaxies are too far away to easily image them in X-rays. 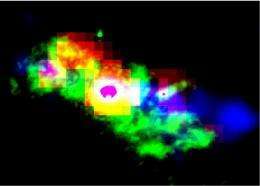 A team of six CfA astronomers led by Junfeng Wang, together with one of their colleagues, used the Chandra X-ray Observatory to study the galaxy NGC 4151, at about 40 million light-years away one of the closest active galactic nuclei. Its radio jet is small, only about 700 light-years long, making this galaxy a good example of the more conventional jet sources. Moreover, the Hubble Space Telescope has provided detailed optical images of the inner regions. The scientists' new observations are the first very deep X-ray images of this nucleus. The astronomers were able to compare the detailed morphology of the X-ray emitting gas with that of the ionized light seen in the optical, comparing for example the knots of activity along the jets. They find that the overall physical conditions of these knots are the same independent of the distance of a knot from the black hole. The scientists conclude as a result that one of the most commonly advanced theories about the emission, one that relies on magnetic fields, is not supported, at least in this class of galaxy. Instead, the new results tend to indicate that an outflowing wind is slamming into clouds of gas in the local environment, and that these interactions are generating the X-rays. The results help to explain how and why the jets in these more modest sources compare to those in the more extreme examples, and thereby also lend credibility to our general understanding of these amazing cosmic beacons. No, not powered by black holes. Powered by repulsive interactions between neutrons in massive neutron stars. See: "Neutron repulsion confirmed as energy source", Journal of Fusion Energy 20 (2003) 197-201 or "The Sun is a plasma diffuser that sorts atoms by mass", Physics of Atomic Nuclei 69 (2006) 1847-1856; Yadernaya Fizika 69 (November 2006) number 11.